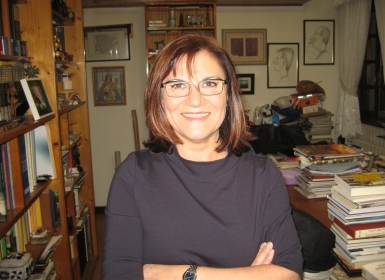 Fina Casalderrey is one of Galicia’s most successful writers of children’s and young adult fiction and taught for many years at secondary level. She has published more than forty books and twice been nominated for the Astrid Lindgren Memorial Award (in 2010 and 2012). In 1996 she was awarded the Spanish National Prize for Literature for The Mystery of Lúa’s Children. Her works have been included in the White Ravens Catalogue (Marriage Forbidden, Papa! and Who Wants to Adopt Me?). She has also written on Galician gastronomy. Her works have been translated widely inside Spain, and into English, French, Italian, Korean and Portuguese. Dove and Cut Throat (176 pages) is one of Fina Casalderrey’s more recent novels, first published in 2007, which has been translated into Spanish. It is divided into twenty-two chapters. A teenager, André, is bullied at school by Raúl Pernas and others, and has difficulties knowing how to present himself in order to avoid problems. To a friend, Halima, he admits he needs help lifting himself off the ground from time to time; to others, he presents himself as more aggressive, someone they shouldn’t mess with. He has another friend he chats with on the Internet. Her chat-name is Dove, and he is Cut Throat.